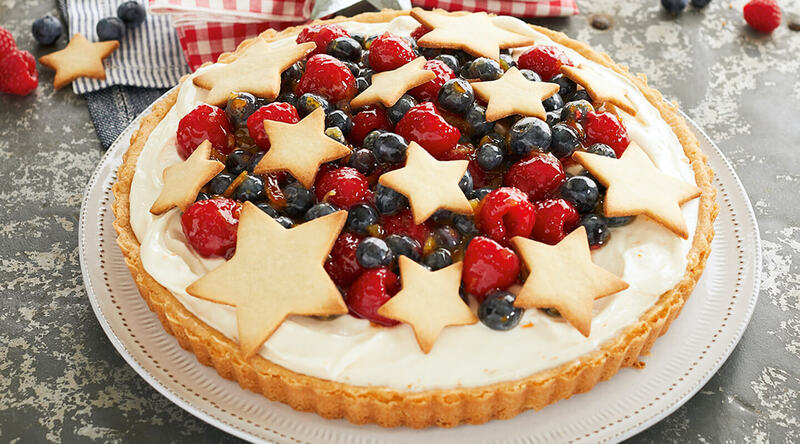 Brimming with berries and whipped ricotta and cream cheese filling, this dessert boasts patriotic colors ideal for a festive Fourth of July party. Swap in a flower cookie cutter for the star to serve this tasty treat all summer long. Look for the Proudly Wisconsin Badge when shopping for cheese. Any brand of Wisconsin Cream Cheese or Ricotta can be used in this recipe. Heat oven to 325˚F. Grease a 10-inch tart pan with removable bottom. Pat three-fourths cookie dough onto the bottom and up the sides of pan. Bake for 12-15 minutes or until light golden brown. Cool completely on a wire rack. Meanwhile, roll out remaining dough on a lightly floured surface to 1/8-inch thick. Cut with a floured star cookie cutter. Place 1 inch apart on a parchment-lined baking sheet. Bake for 10-12 minutes or until light golden brown. Cool on a wire rack. Beat the cream cheese, ricotta, sugar, orange zest and vanilla until smooth. Spread mixture over crust. Refrigerate for at least 1 hour. Combine the marmalade, orange juice and cornstarch in a small saucepan. Bring to a boil over medium heat. Cook and stir for 1-2 minutes or until slightly thickened. Remove from the heat. Cool completely. Gently toss berries and orange glaze in a large bowl. Spoon berry mixture over tart. Top with star cookies. Refrigerate until serving.